The apartments at Camden Russett include custom details like built-in bookshelves, walk-in closets, vaulted 9-foot ceilings with crown molding, fireplaces with mantels, linen closets and kitchen pantries and garden tubs. We make life easier with conveniences like a washer and dryer and cable included with every apartment. 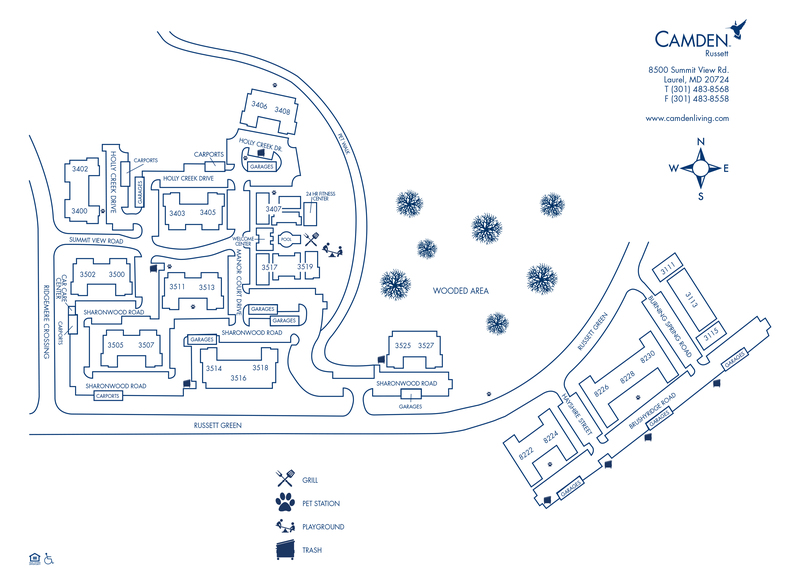 Camden Russett provides optional garages, covered carports and a car care center! Residents receive a technology package included in the total monthly rent with a savings of up to 47% off retail. This money-saving package includes high-speed internet up to 100 Mbps and over 140 digital video channels through Xfinity. Use the Xfinity Go app on your smartphone or tablet to access your digital video anywhere! As a resident, you’ll have access to Camden Russett’s amenities including a swimming pool, outdoor dining and grill area, and 24-hour fitness center. There's no need to keep the costly gym membership going, get a head start on planning all your new workouts by checking out a virtual tour of our fitness center here. We’re less than 10 minutes from the MARC train, close to Arundel Mills Mall and convenient to BWI Airport! With access to I-295 and I-95, Camden Russett makes it easy to access events at Fed Ex Field, the excitement of National Harbor and the culture of Washington DC! With all this at your fingertips why would you live anywhere else? Your new apartment awaits you at Camden Russett. At Camden, your pets are family too! We welcome cats and dogs, up to two pets per apartment home, with a full-grown maximum weight limit of 75 pounds each. Detached garages are available for rent for $175 per month and carports are available for $55 per month.